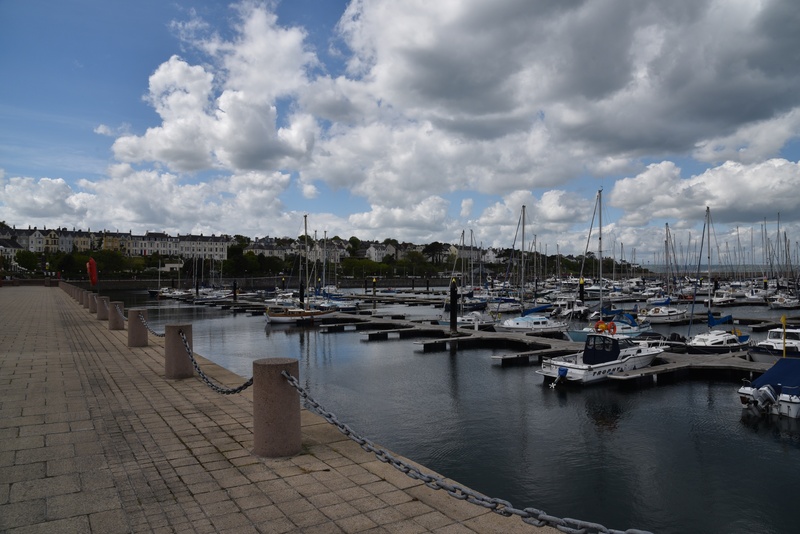 There are four townlands in County Down called Corporation, all connected to towns (like Corporation in Killyleagh). Today I’m writing about the one in the town of Bangor. This is the view from the air. How much of the town of Bangor is within the townland of Corporation? On the coastline, Corporation starts at the edge of Ballyvarnet in Smelt Mill Bay, goes round the headland in to Bangor Bay, past the marina, out to the next headland, stopping at Waverley Avenue in Ballyholme Bay. Going inland, the A2 ringroad isn’t a bad guide to the southern boundary of Corporation, as far as the Gransha roundabout. This is another view of Bangor, from the 17th century, before the roundabouts. The old map is part of a display at the North Down Museum. 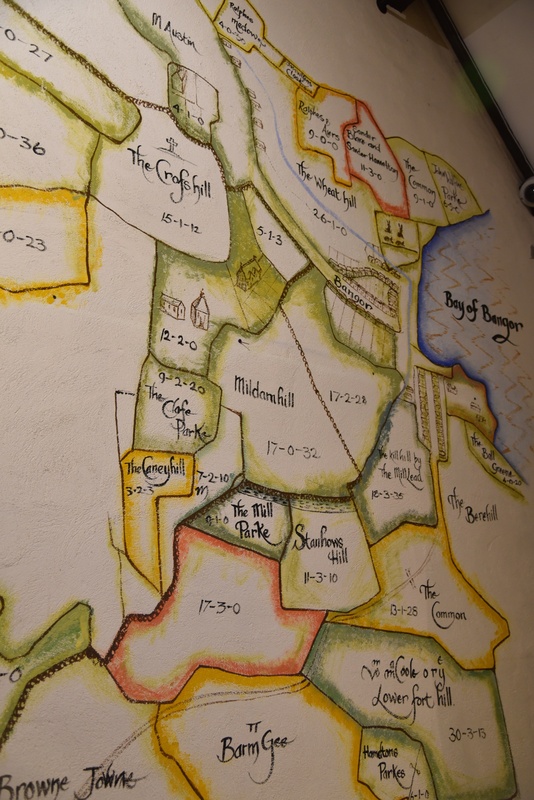 The maps were created by Thomas Raven in 1625 for the Clandeboye Estate, and are a great resource for anyone interested in the local townlands. Visitors to the museum can see digitized versions of the Raven maps, and search for individual townlands. The museum is housed in the courtyard and outbuildings of Bangor Castle. The Castle itself (more a 19th century mansion than a castle) is used for local government. 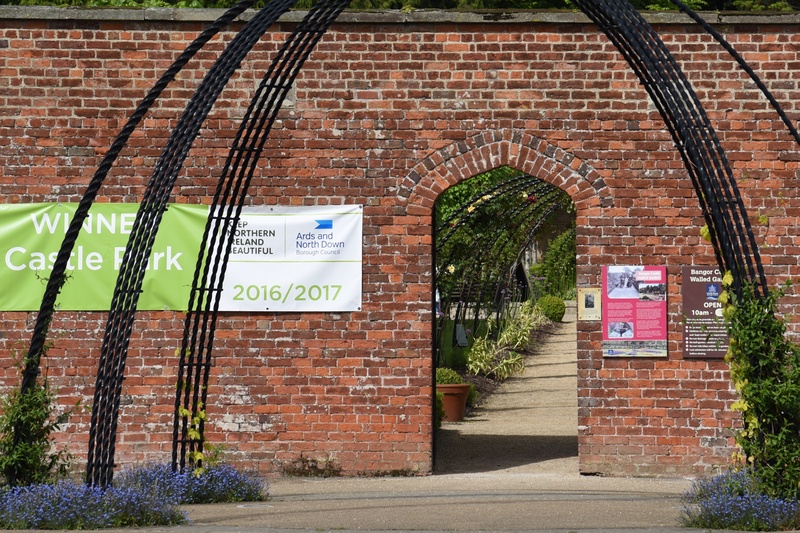 The surrounding parkland and walled garden are open to the public. 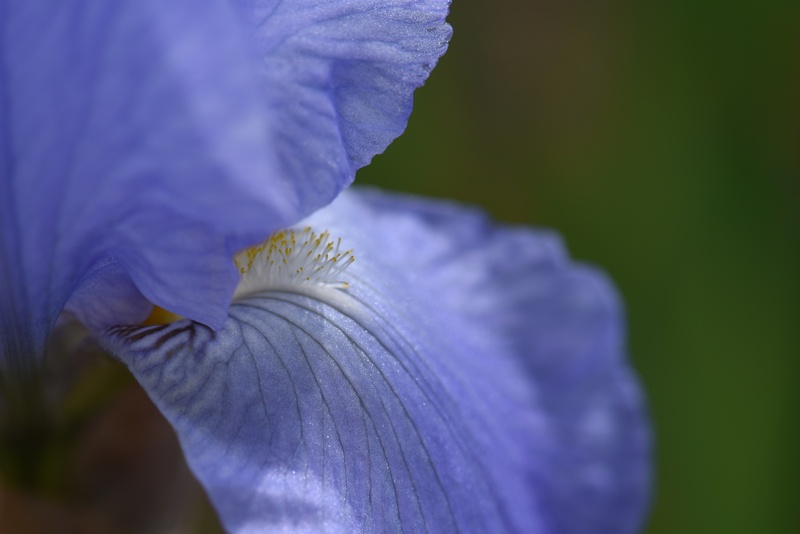 I got very close to the flowers in the walled garden, learning how to use my new macro lens. 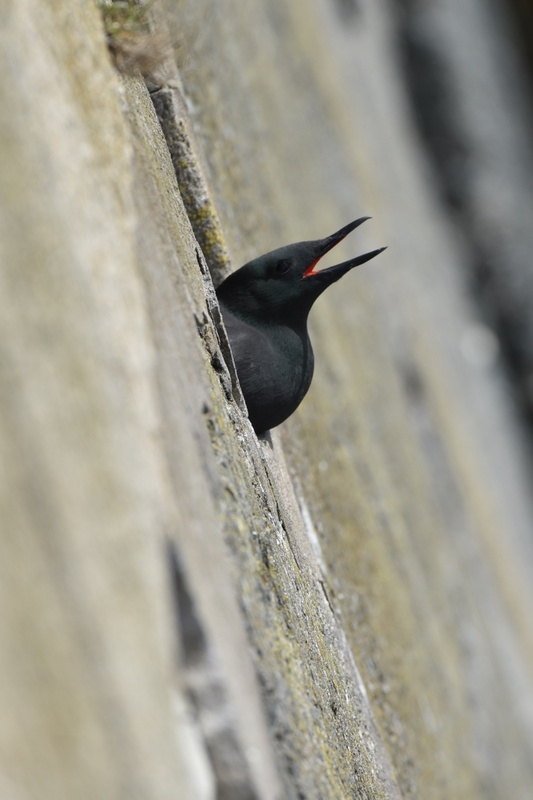 Changing camera lenses, I went down to the marina, where a colony of black guillemots (Cepphus grylle) has thrived by nesting in concrete crevices in the harbour walls. Identifying the birds gets easier when they fly, showing their white plumage and red feet. If you don’t have a field guide, you can refer to the drawing on the Guillemot cafe across the road from the harbour. 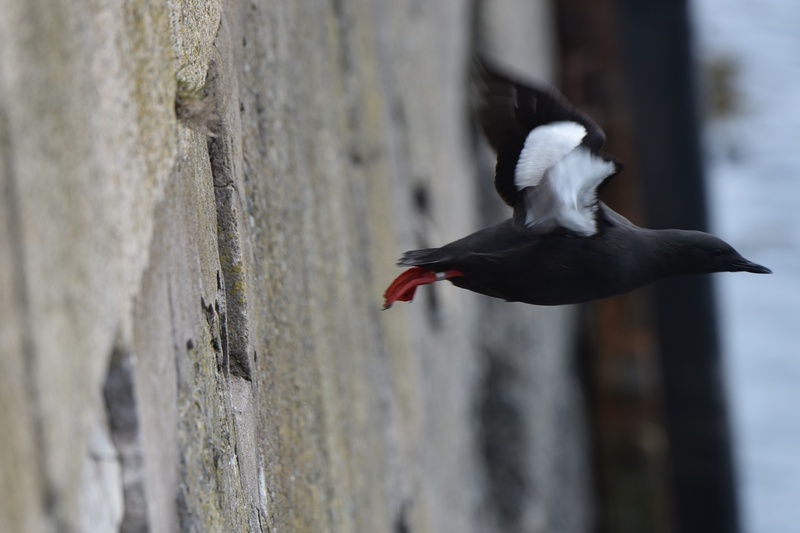 Click here to read more about the local conservation efforts for the guillemots. Which townlands border Corporation? 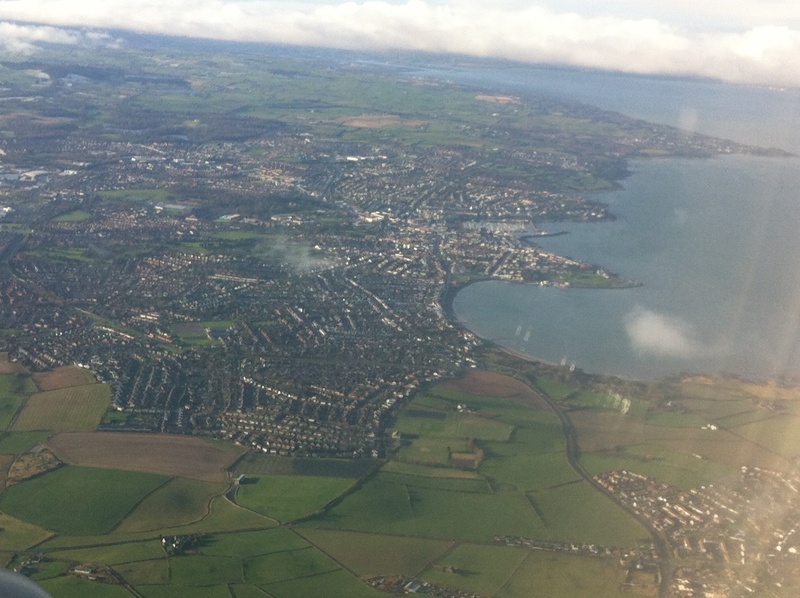 To the east, Ballymagee and Ballyholme. To the south, Rathgill and Balloo. To the west, Ballyvarnet. To the north, the sea of Bangor Bay. Click here to see a map of Corporation on Townlands.IE.